A change in federal law’s overtime rules that would make millions more Americans eligible for overtime pay? Sound too good to be true? A federal judge thought so, too, when heissued an injunction last month preventing the rule from taking effect. Previously, the Department of Labor set the law in place to be effective December 1, but with this injunction, the future of the law is uncertain. In fact, some proponents of the rule are concerned that it will ultimately fail to help many employees across the country who could have benefitted from it. What should you know about the overtime rule and how it could impact employee rights? What if you are an employee who would fall under the rule? As explained by the U.S. Department of Labor (DOL) in May 2016, President Obama announced a DOL final rule that updated overtime regulations and, when it took effect, would have extended overtime pay protections, automatically, to more than four million workers within the first year alone based on their current income(s). 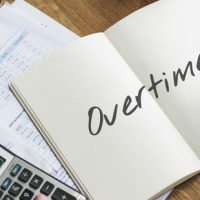 Without the rule, and currently under federal law and Florida law – an employee who earned just $23,660 per year may be deemed “exempt” under the overtime rules and otherwise would not be eligible for receiving monies for hours worked over 40 hours in a week. This is true regardless of the amount of hours worked per week. However, with issuing this new, final rule, the DOL recognized that individuals who receive just $23,660 are at and sometimes below the poverty line, and thus, the final rule increases that minimum threshold for exemption under the overtime rules to $47,476 annually – or a salary in the 40th percentile of earnings of full-time salaried employees located in the lowest-wage area of the country. As such, under the final rule, only employees who make $47,476 or more per year would fall under the overtime exemptions – and not be entitled to overtime pay for hours worked over 40. As you can see, the final rule would have doubled the annual salary for which workers could be eligible for overtime pay, allowing more employees across the country to receive compensation for extra work. The rule resulted from actions in 2014, when President Obama signed a Presidential Memorandum which directed the Department of Labor “to update regulations defining which white collar workers are protected by the FLSA’s minimum wage and overtime standards.” In July of 2015, the DOL published a required Notice of Proposed Rulemaking (NPRM) concerning the update to overtime pay regulations, and it received more than 270,000 comments. However, the implementation of the final rule came to a halt in December when a federal judge issued a nationwide injunction, preventing the rule from taking effect by arguing that the Obama administration had exceeded its authority by raising the overtime salary limit so significantly. Does this mean the final rule will never take effect? The injunction is only temporary until the judge can issue a ruling on the merits, but many believe that the language used in the injunction suggests that the judge will find against the rule based on its merits. The U.S. Department of Labor spoke out against the judge’s injunction, emphasizing that the rule resulted from a comprehensive, inclusive rule-making process and that it thus should have been respected and implemented. What does this mean for employees who hoped to benefit from the overtime rule? Commentators suggest that it is unlikely those employees will see the benefits from the final rule anytime soon, but we will have to wait and see. In the meantime, if you have questions about employee rights to overtime pay or whether you are properly classified as an exempt employee under the law, an experienced Florida employment law lawyer can assist you. Contact Scott • Wagner and Associates today.